Glycerine soaps are typically clear, tho they can come in may varieties. These are natural clear glycerin soaps with added color and fragrances. These all have an extra 20% of glycerin added to them and have a luxuriously creamy lather. There are soaps here for the whole family to enjoy, kids LOVE my soap as do adults. Each of these soaps are different in size but run about 5 ounces each. I love looking at a light thru these soaps.. they are gorgeous. Softer than the cocoabutter soaps they won't last as long as the cocoabutter soaps, however they are so pretty we don't care. When I get creative, these are the soaps I make, when the batch is gone, they are gone tho unfortunately. These are mostly very large bars, but priced according to size, work and fragrance type.. the large bars are typically 6-8 oz. Ingredients: Coconut Oil, Palm Oil, Castor Oil, Safflower , Glycerine (kosher, of vegetable origin), Purified Water, Sodium Hydroxide (saponifying agent), Sorbitol (moisturizer), Sorbitan oleate (emulsifier), Soybean protein (conditioner), mica colorants and fragrance either natural or synthetic. 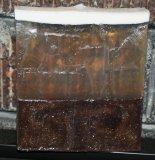 for the Amber lover, very romantic scent..
100% Soap, scented with Northwoods fragrance, 5.5 - 6 oz. 100% Soap, 5.5 - 6 oz scented with Northwoods fragrance. a timeless fragrance.. for men. scented with Kaulua Bay fragrance oil.. wonderful ! Large Bars, 6-9 oz. scented with Kaulua Bay fragrance. Smaller 4.5 - 6 oz bars for smaller hands..
Clear Glycerin in light blues and white to look like water... in our duplcation of Polo's Blue scent..
large bars, strongly scented.. wonderful! Large bars, what a fresh lime scent combined with a little spiciness!